Vikramaditya Motwane's directorial debut is a haunting mirror held to the life of a teenager, his angst and the urge to break free. There are no self-created demons for Rohan (Rajat Barmecha,fine debut act), it is his own father that he has to break away from. He does so without any exaggerated drama, quietly, so uncharacteristic in a commercial Hindi film. We like that. A story pattern that is as subtle, mysterious and revealing as life itself, Udaan (Flight) has a brooding quality, especially in its portrayal of drowsy Jamshedpur's smoke-chugging factories as a setting and Bhairav Singh,(Ronit Roy's a surprise!) the tense, edgy and unkind father. The characters are all real and ordinary as they come - with their little heroics, frustrations and vulnerability. Rohan's uncle and Bhairav's younger sibling Jimmy (Ram Kapoor, well cast) is supportive, but not courageous enough to support his nephew's cause. Other shades of youth are seen in the bullying, bickering ways of Apu (Anand Tiwari, a natural) and Rohan's three school friends - all varying shades of boys who can still be crybabies or dare to mock an adult. Then there is Arjun (Aayan Boradia, excellent), the six year-old who is a puppet to his father's whim. Amit Trivedi's music that adds a nice touch to the visuals, although his soundtrack for Dev.D (2009) was much more impressive and uh,epic. Amitabh Bhattacharya's lyrics add verve to the songs that includes Kahani - the song that seems to have a hangover over the other tracks. 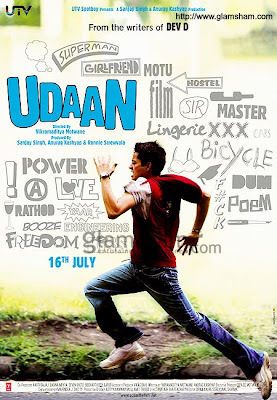 Overall, Udaan is a heartbreaking and rejuvenating slice of life. It's 'realness' may nudge formulaic film watchers a bit. But then the film is not meant to be another vegetable in the market. It is an unmissable piece of art and needs to be watched on the big screen. The story-telling sequences in the hospital where doctors and nurses gather to listen Rohan's narration needed more flesh for the audience to be drawn into it.